Okay, I'm confused. 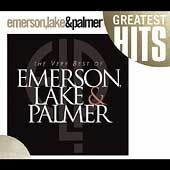 The earlier "Best of Emerson, Lake & Palmer" has nine tracks, but "The Very Best of Emerson, Lake & Palmer" has thirteen. Now, I'm not a professional logician, but shouldn't "The Very Best" be a subset of "The Best"? That is, shouldn't it be a smaller group winnowed from the "best," a group of absolute must- haves? One would think so, but when it comes to marketing music to aging boomers who need to be cajoled into picking up a CD out of the remainder bin, who cares about making sense? I can just imagine the pre-release meeting, "Just start the CD off with 'Lucky Man' and you can call it whatever the hell you want." Nevertheless, the CD is available now for purchase and deserves at least one review by someone who gave a damn about ELP when they mattered (which was longer than they gave a damn about their fan base). Now, the reality is this is a collection of the ELP pieces that were most often played on the AOR FM stations in the '70s. No more, no less. With the possible exception of "Trilogy" and "The Hut of Baba Yaga/The Gates of Kiev," all these songs were extensively played on radio in the '70s (and continue to be played on classic rock stations). Of course, all these songs are good ELP tracks, even top-notch ELP. But are they collectively the "very best"? No, they are not. Look, if you are going to call a compilation album by any group the "very best," you better be ready to defend your choices to the core fan base. And it's obvious that serious ELP fans were not part of the compilation process. And that's it; that's all that fits. This music represents the very best of what they have done. Now, I know there are many other great tunes, but given the approx. 80 minute time limit, this is the best that can be done. "Lucky Man": Of course, the song the band is most known for, which is a shame. The song itself made up of a mediocre melody and the lyrics, while intriguingly archaic, fail to create more than a caricature of a "lucky man" (and one, incidentally, that few could care about: a prince, with white horses and ladies "by the score;" this is lousy poetry). The theme is, of course, interesting: the bounty and beauty of life seized and replaced with the cold finality of death. But this rather chilling theme should have been better lyrically rendered. Emerson's solo at the end of the tune "luckily" saves the song from the oblivion it deserves with his dread-evoking synth runs. "Trilogy": This is a great tune and would have been my next choice if I had room. But the CD is already top heavy with Trilogy tunes, so I had to dispense with it. "Jerusalem": I don't know how this got selected. This cover of an "olde" English hymn was a bad choice by Greg Lake, who should have been coming up with more compelling original stuff. "From the Beginning" shows what Greg Lake can do if he works at it. This track certainly doesn't belong on a "very best of" album. "Still, You Turn Me On": In the context of "Brain Salad Surgery," this is a nice airy acoustic ballad to offset the intensity of the other tracks, but weighed in the balance of the band's entire catalog, it does not buoy to the top as one of the "very best." A lot of what Greg Lake wrote was this sort of melodramatic , radio-friendly pop. But with a line like "Someone get me a ladder," I think I need not put up much of a defense of my choice to leave it off. "Pirates": This is an overblown disappointment. Even with Sinfield to assist with the lyrics (and it was wise of Lake to ask for assistance), Lake was creatively spent at this point, and rather than take some time to rethink his approach, he instead wrote this embarrassingly childish paean to pirates, of all things. And instead of realizing it was, a bad idea badly rendered into music, he just poured on the production values hoping the sheer bombast would convince its listeners of its greatness. Needless to say, the listeners saw through it. "Fanfare": This is sort of Emerson's "Pirates." Same sort of problem and same critical argument applies, though the end result was more listenable. Compared to the band's earlier tracks, it measures up, but barely. "Cie la vie": Not bad; it's catchy, but not the "very best." "Peter Gunn": Good live ELP, but Emerson can do this sort of thing in his sleep. He's the master of riffing and improvising off the classics, but there's already "Toccata," and "Hoedown" (not to mention "Knife Edge" which was inspired by Janacek's works). Good enjoyable ELP, but not the "very best." "Hut": "Pictures at an Exhibition" was meant to be heard as a single piece, and I don't think a "very best" compilation should be splicing up tunes. Besides, these two tracks are not the best on "Pictures" anyway. I'm really curious who chose these to be included. Well, enough said. ELP is best heard album by album, not collected. This is ELP we're talking about, not Herman's Hermits. Now, I know there are a few of you who may be wondering why I didn't include anything from "Love Beach." Well, I'll save that for another day.